Ancient cultures valued natural botanical moisturizers to nourish a beautiful complexion. Pure pressed olive fruit oil, castor oil, black seed oil, raw honey, and frankincense are found in sacred text, traditional ceremony, and historical record. 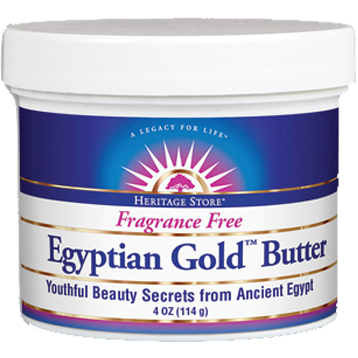 Egyptian Gold„¢ Body Butter is further heightened with the invigorating secret of the queen bee€™s energy: propolis and royal jelly. The mysterious appeal of Egyptian queens Cleopatra and Nefertiti is thought to have been accentuated by these legendary skin treatments for powerful beauty. We are honored to bring these luxurious ingredients to you. Ingredients: Olea Europaea (Olive) Fruit Oil, Beeswax, Glyceryl Stearate, Raw Honey, Ricinus Communis (Castor) Seed Oil, Nigella Sativa (Black Cumin) Seed Oil, Tocopherol (Vitamin E), Boswellia Carterii (Frankincense) Oil, Propolis Extract, Bee Pollen and Royal Jelly. Directions: Rub a small amount into clean hands to warm and liquefy to oil. Gently apply to nourish and moisturize beautiful skin. Free of parabens, phthalates, artificial color and artificial fragrance. Caution: For external us only. Avoid contact with eyes. Keep out of reach of children. If irritation, redness or discomfort occurs, discontinue use and consult a licensed health care practitioner.